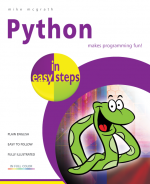 Python in easy steps instructs you how to program in the powerful Python language, giving complete examples that illustrate each aspect with colourized source code. 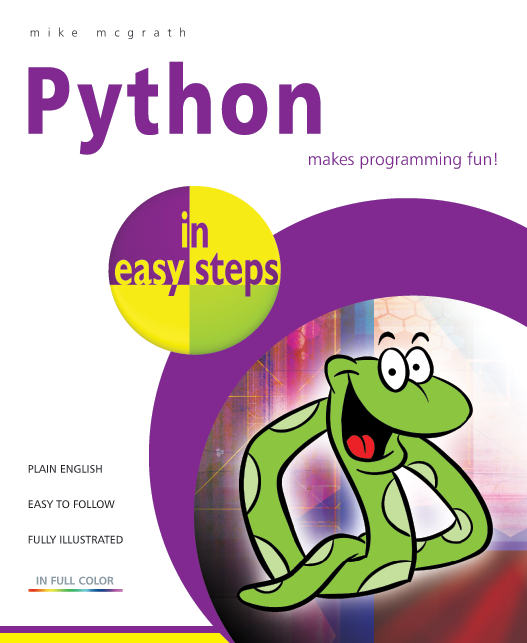 Python in easy steps begins by explaining how to install the free Python interpreter so you can quickly begin to create your own executable programs by copying the book's examples. It demonstrates all the Python language basics before moving on to provide examples of Object Oriented Programming (OOP) and CGI scripting to handle web form data. The book concludes by demonstrating how you can use your acquired knowledge to create and deploy graphical windowed applications. Python in easy steps makes no assumption you have previous knowledge of any programming language so it's ideal for the newcomer to computer programming. It has an easy-to-follow style that will appeal to programmers moving from another programming language, and to the student who is studying Python programming at school or college, and to those seeking a career in computing who need a fundamental understanding of computer programming. Python is the language used to program the Raspberry Pi - covered by Raspberry Pi in easy steps. The Python 3.x language is under active development so frequent new releases are made available as small improvements are added to the language and Python in easy steps features the very latest versions of Python at the time of publication. 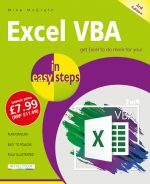 Python development is one of evolution, rather than revolution, so the examples provided in the book can be used in subsequent releases – simply download the latest version of Python then follow the easy steps.